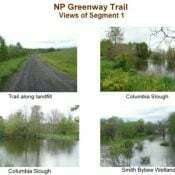 New path funded by a tax on heavy trucks. 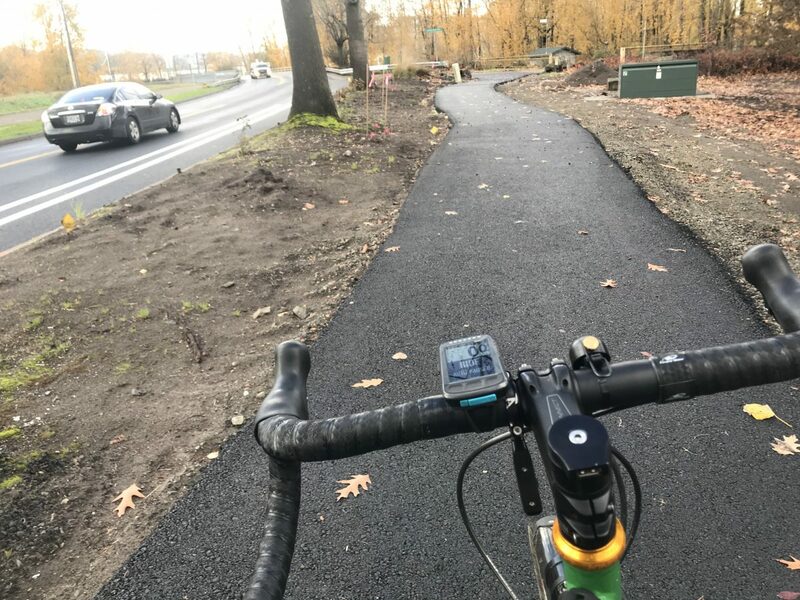 The 40-Mile Loop is now slightly larger thanks to a new path near the entrance to Kelley Point Park. 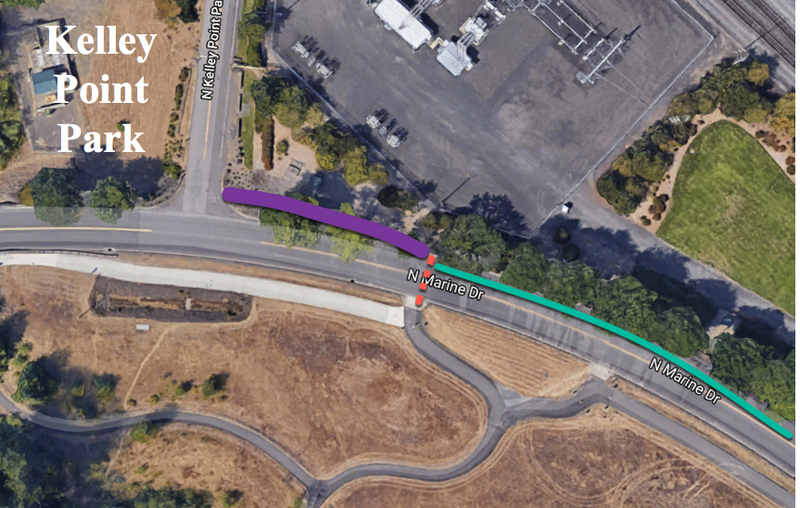 Green line is buffered bike lane, purple is new path. Red line is where there are two curb ramps but (so far) no crossing treatment. 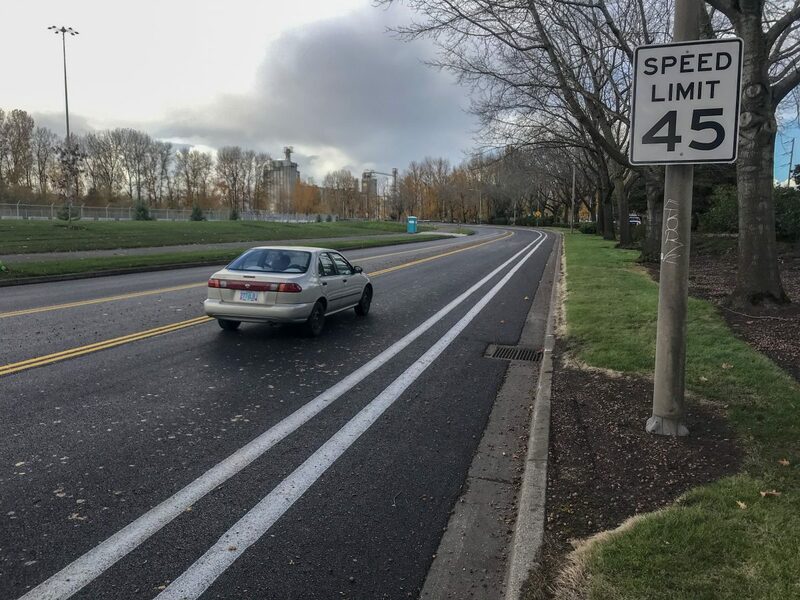 The City of Portland Bureau of Transportation (PBOT) has striped a buffered bike lane on the north side of N Marine Drive for one-third of a mile between Leadbetter Road and the entrance to the park. 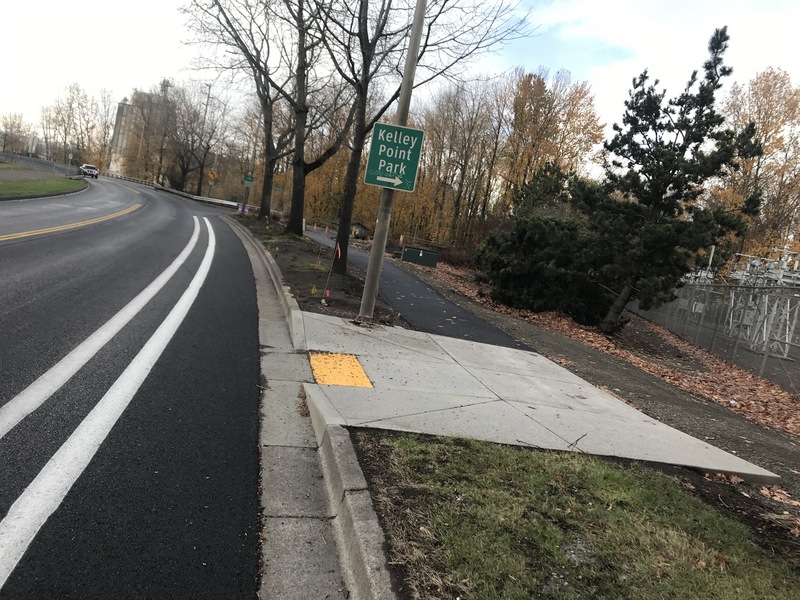 They’ve also installed a new ADA curb ramps on both sides of the street to better connect the new path to the existing section of the 40-Mile Loop. 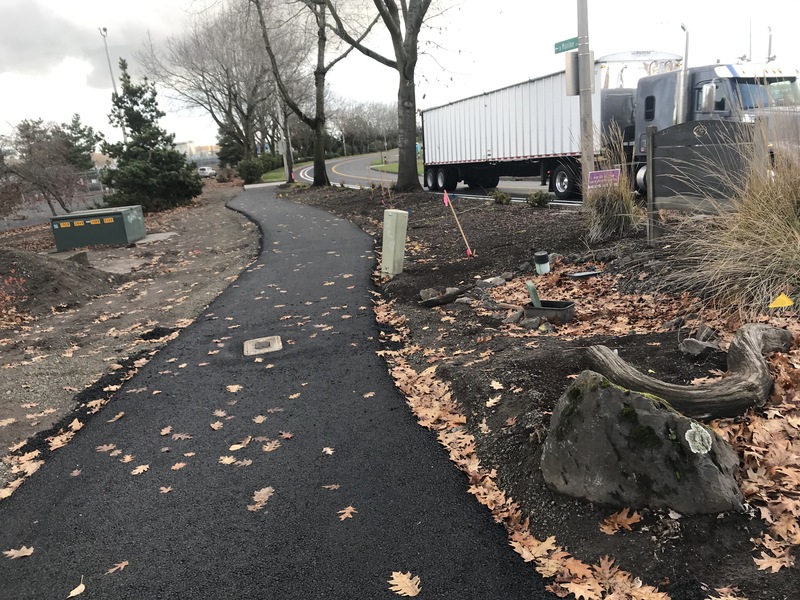 The updates come as part of a paving project funded through PBOT’s Heavy Vehicle Use Tax that was passed in 2016 as part of what’s more commonly known as the Fixing Our Streets program. This is one of three projects on heavy freight corridors funded through that tax this year. Others include paving on Lombard and Going (Interstate to I-5). The Heavy Vehicle Use Tax was passed by City Council with a promise that it would raise $10 million per year for four years thanks to a 2.8% weight-mile tax. However, The Oregonian reported yesterday that after facing pressure from freight industry representatives, City Council is poised to repeal “pare down” the tax with a new ordinance at their meeting today. “Truckers generally view the city tax as cumbersome and unfair, said Jana Jarvis, president of the Oregon Trucking Associations. She said it’s right for Portland to axe the revenue goal because the city will get additional money for transportation from the state owing to an infrastructure bill passed last year. Looking southeast at Marine Drive from the new path. View north from the end of the 40-Mile Loop path. Looking northeast at the new curb ramps. Looking northwest toward the main Kelley Point Park entry from the new buffered bike lane. Looking west toward the park from the new buffered bike lanes. PBOT says the tax isn’t bringing in nearly as much as they expected. In order to meet the $10 million revenue target they’d have to raise the tax rate by 60 percent for the final two years. Instead of doing that (and face the ire of freight interests), they want to maintain the existing tax rate and adjust the project list to meet the resulting lower revenue. You can read the ordinance up for debate at today’s Council hearing here. Another thing that concerns me about this new path and crossing is that it’s just a few hundred feet away from the main entrance to the park. This means we must trust car and truck drivers to slow down and scan for other road users at two locations in succession instead of just one. Large trucks have an immense impact on our road system, both in terms of wear-and-tear and safety. We need to make sure trucking companies are paying their fair share so we can create safer, longer-lasting streets that are welcoming to all users. UPDATE, 10:11 am: The ordinance to remove the $10 million target language from the existing Heavy Vehicle Use Tax ordinance just passed council 3-1. Eudaly, Saltzman and Wheeler voted in favor. Fritz voted against it on grounds that it would break a promise made to voters who passed it. Saltzman and Wheeler said it was a good compromise. We’ll debate this again in 2020 when the Fixing Our Streets program comes up for renewal and it’s likely this truck use tax will be a big part of the conversation. It’s not only Portland. Americans are unique in that they continue to elect, and then re-elect, politicians who cater to monied interests over their needs and well being. Puzzling. The American with Disabilities Act, under rules adopted, requires pedestrian crossings to meet roadways at 90 degree angle to the curb or entry point. Except in the transit mall downtown. Maybe you’re confusing the corners with midblock? Corner ramps also have to be perpendicular, it’s just the curb is changing directions at corners. 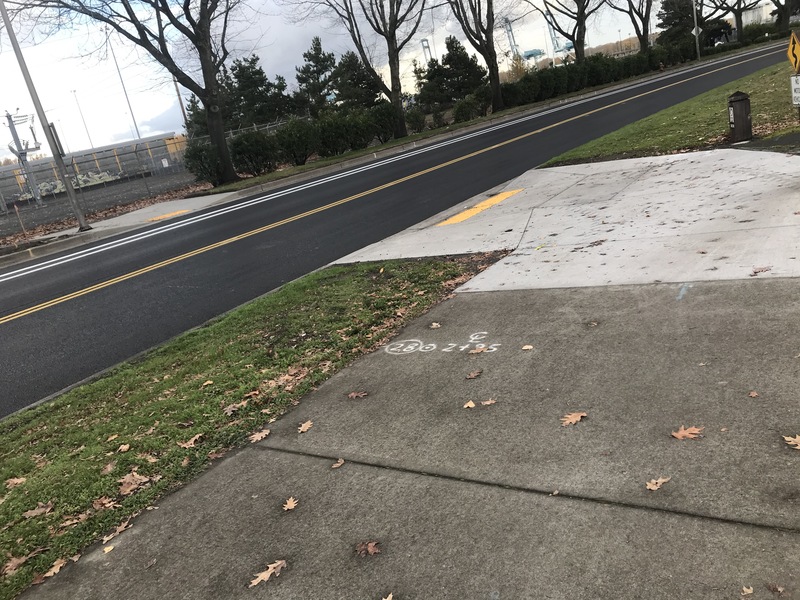 That ADA requirement explains the 90 degree entry onto the path, but it doesn’t explain why the designers chose to make the curb cut so narrow. Given that this curb cut serves bikes turning from the street onto the path, they could have made the curb cut (the flat part that bikes can ride onto) triple that width. 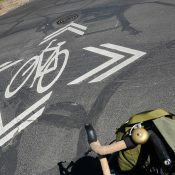 Then bikes wouldn’t have to slow down so much to make a near-90 degree turn, and it would still meet ADA regulations. As it is, if you make a mistake making the turn into the narrow flat portion of the curb cut, you risk having your back tire hit the sloping curb of the ramp. If you don’t turn sharply enough, you’re aimed right at the light pole. 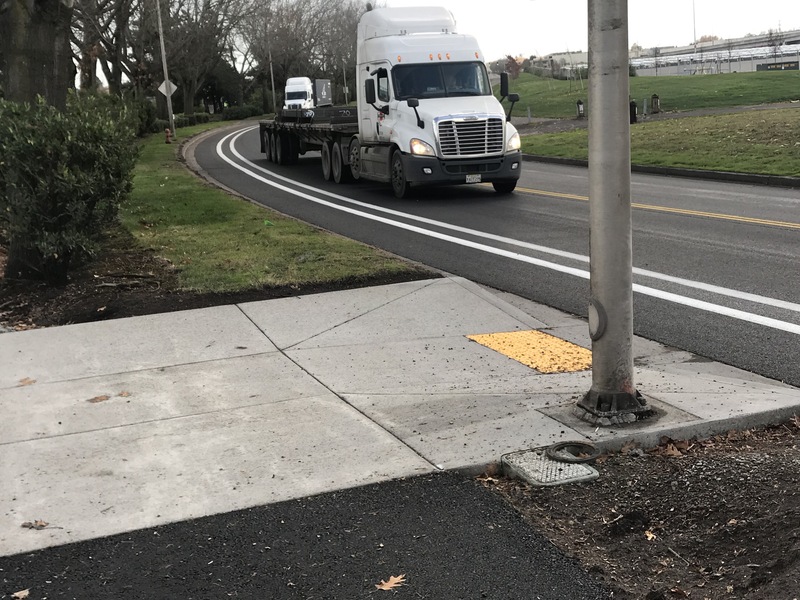 The narrow curb cut also guarantees that if walkers are waiting (even one person) to cross the street, they’ll be clogging the exact location someone biking on the road needs to use to turn onto the path. It’s obviously not for bikes. its not, it was made for the construction company to profit millions. First thing that stood out to me. I think it’s one of those things where bikes can use it, but it’s primary purpose is for pedestrians. At least there’s not a big metal pole to hit if you don’t slow down enou—oops, never mind. Midblock crossings are not legal unless marked. Can you site your fact? 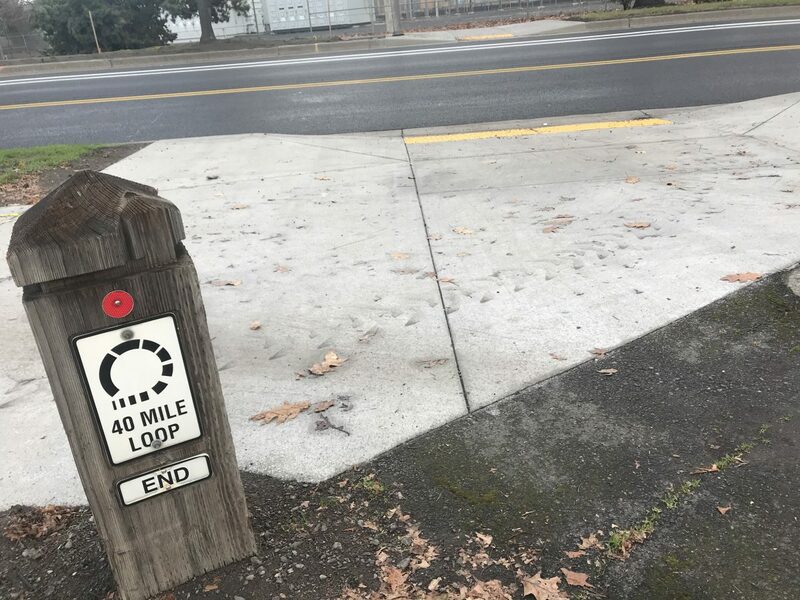 My understanding is that, in Oregon, if you are 150 feet or more from an intersection, it is legal for you to cross midblock (Straight across) when it is safe to do so. Am I wrong? Link to ORS please, paikiala? Looks like it might be just under 150′. Impossible to tell from Google Maps. I’ve heard that 150′ rule before, but every time I go searching for it, I can find no documentation of it. No pedestrian may cross a street other than within a crosswalk if within 150 feet of a crosswalk. Unless marked, the statutory definitions (1) and (2) define the location of a crosswalk in Oregon. The ramps are about 140 feet from the park driveway, if that meets the definition of a roadway. You could cross there, it would just not be a legal crosswalk until marked. (b) The prolongation of the lateral lines of a sidewalk, shoulder or both, to the sidewalk or shoulder on the opposite side of the street, if the prolongation would meet such sidewalk or shoulder. The park driveway does not count as an intersection. For Oregon and Portland the definition of an intersection is when 2 or more roadways intersect. Not marked crosswalks. They are there to inform those with vision deficiencies they will be entering a roadway. They are unlikely to be visible to a motorist – the other reason to mark crosswalks at unexpected locations. I agree completely with that. Even curb cuts are not highly visible to people driving 30 or 40 mph. Mid-block crossings that are created with curb cuts are dangerous without pavement markings. I don’t understand why PBOT creates them without taking the next obvious step of painting crosswalk markings. There’s one I’m familiar with that I’ve been trying to get PBOT to do something about for years, with no luck. I also wonder what the legal situation is if a pedestrian gets hit crossing mid-block at a crossing created with curb cuts, but lacking pavement markings. The pedestrian will claim (correctly) that the curb cuts imply that it’s a proper place to cross. The driver who hits him will claim he couldn’t see the curb cuts and there were no markings, and he didn’t expect to find someone crossing at mid-block without a marked crosswalk. Now, reading the definitions, it seems a judge might even rule the curb cuts at midblock without markings are not a legal crosswalk, so the pedestrian shouldn’t have crossed there. That was exactly my point. And how is a legally blind person supposed to know there’s no striping there? All the other updated tactical clues are there for them. Yes, it’s nuts. Tell the pedestrian you should cross here, but don’t tell the drivers that anyone will be crossing. In the example I gave, there’s also a 6′ high bush that people crossing stand behind, so they can’t be seen until they step into traffic, and drivers can’t see them until they do step into traffic. Obviously the bush also hides the curb cut from drivers. I told a PBOT crew that was trimming the bush (from about 8′ high to about 6′) they should trim it shorter, but they said they couldn’t because it might hurt the bush. I actually got a great response from calling PBOT but the guy was retiring the next day and said he’d try to get someone to do something, but that was months ago. I’d reported it before over the years also–still there. I’m confused. Why was this constructed when there is already an underpass adjacent to the slough that just needs a short connection to the Kelley Pt. roadway? The Underpass to Nowhere (built by the Port of Portland?) has been there for at least a decade, awaiting a connection through Parks property. Does Parks have any plan to do this, ever? Jonathan, in this era of over-exaggerated and outright fabricated articles, I would think a publication such as yours would do more research into these important matters affecting our city rather than simply making stuff up. The Heavy Vehicle Use Tax was passed by City Council with a promise that it would raise $10 million per year for four years thanks to a 2.8% weight-mile tax. However, The Oregonian reported yesterday that after facing pressure from freight industry representatives, City Council is poised to repeal the tax with a new ordinance at their meeting today. I made a mistake by using the word “repeal”. I’ve edited the story. Mistakes happen sometimes. I am not a robot. And I absolutely did not make that mistake with any misleading intent in mind. And your little insulting jabs at the quality of work are hurtful and unnecessary. And if you read the entire post you’ll see I explain the council intent accurately. “In this era of over-exaggerat[ion],” Clicky begins, without the slightest sense of irony. This is interesting. Back when Novick proposed this tax at City Council, I was the only active transportation rep that testified in favor of it. All other testimony was freight industry folks opposed to it. Amazingly, Council decided to move it forward – likely due to their promise to voters with the gas tax. I doubt anyone has been knocking on PBOT/commissioners doors about the importance of maintaining this tax. Meanwhile the freight industry has likely been knocking consistently on their door opposed to it. I’m not surprised this is getting pared back when there hasn’t been any advocacy to keep it. I am also curious to learn more about this ‘paperwork’, referenced in the Oregonian article that allows trucking companies to say they don’t use city owned streets. That enabled 70% of the eligible businesses to avoid getting taxed. No wonder we aren’t meeting our targets, and now the freight community can point to this tax as a failure – adding to the political pressure to gut it. What’s the point of the path? To give people a more dangerous crossing option? I think that if you’re already in such a hurry that you don’t want to go on the path loop under the bridge to enter the park then this tiny little path isn’t going to help you at all. How many pedestrians will choose to dodge 45 MPH traffic coming over a hill around a curve simply to save 2 minutes? 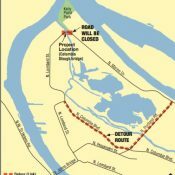 I personally think the solution should be to further develop the existing underpass along the Columbia Slough where the path currently dead-ends into dirth PBOT/Parks/40-Mile Loop/Port of Portland/NPGreenway should sit down and connect the path with the existing park path and/or the park access road. In the graphic below, the solid gold line is the existing path that dead-ends. The dotted lines are where it should be very easy to create a new paved path that would completely avoid Marine Drive. 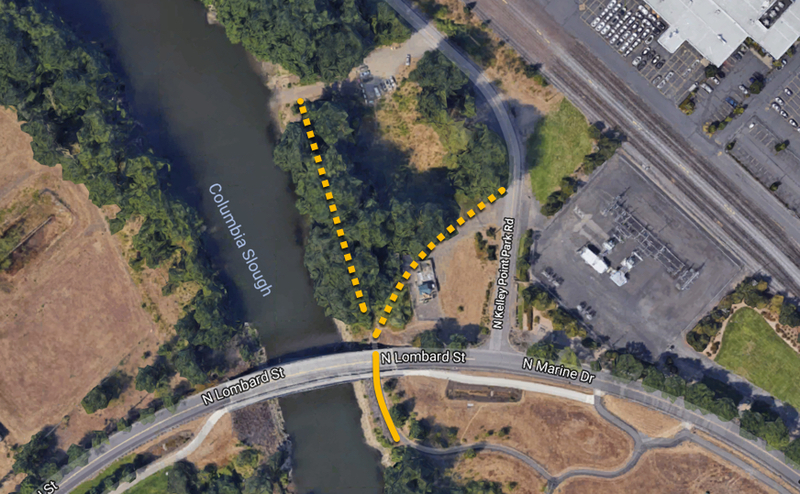 Once the NP Greenway gets built with the forthcoming bridge over Columbia Blvd and the path in the landfill, this connection into Kelley Point Park becomes even more urgent. Come on Portland. Let’s do this! It seems to me that it’s about ADA pedestrian access to KPP, and less about bikes. I’m not super familiar, but there’s no other ADA pedestrian access, right? Of course KPP Road itself has no sidewalks, so this seems somewhat futile under the current state. 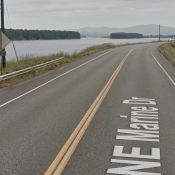 But it’s all they could do under the project scope (Marine repave). Hopefully it sets up for better access in the future. Repaving a road constitutes a substantial change to any pedestrian crossing of that road and per ADA said pedestrian paths must be brought into conformance with ADA, hence the ramps. I suspect the markings, and signs, are pending. That photo with the “Speed Limit 45” sign…ouch! Besides the under-width bike lane getting further pinched by the gutter drain, the drain grate is lined up parallel with bike wheels. Furrfu. It looks like the grate has been modified with welded crossbars. I hope so but I can’t quite see that. Even so, I like grates set with bars perpendicular to travel for two reasons: it’s easier to quickly see that it’s safe(r), and even if a tire can’t drop into the gap the parallel edges can still cause a swerve or balance check. That “40 mile loop END” sign has always been a favourite of mine. It’s like the opposite of a mobius strip. “This is the end of forever” — sounds like a title for a so-horrible-it’s-good sci-fi, come to think of it. I agree with other commenters who point out the existing path under the bridge, which is clearly the safest option. That said, this new alignment of the crossing is better than the zig zag that one was forced to do when crossing from the park’s entrance to the path on the south side of the road. And the site lines for viewing traffic are better as well. It’s both an unfortunate short coming, and an improvement. I enter the park with some frequency, and happy to see this change. When one can of paint fails to protect riders, it’s time to double the paint…because that always works.